About 60 kernels of Indian Corn (Multi-coloured) was planted in three rows 16 feet in length. The kernels were soaked overnight and spaced about 0.8 inches in the row and one inch deep. Birds like corn and dig the seeds once they are aware. The boards protect them until they are too large to be attractive. The mature corn is dried and it is nixtamalized and added to my gruel. 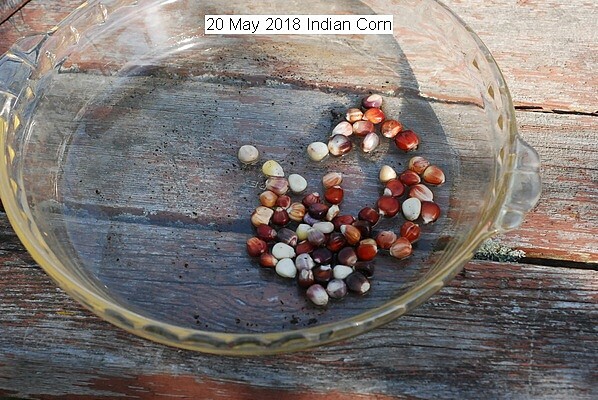 This entry was posted in Uncategorized and tagged 30 May 2018 Indian Corn, Indian corn. Bookmark the permalink.